Downtown Logansport will be green and clean, thanks to our crew of volunteers! 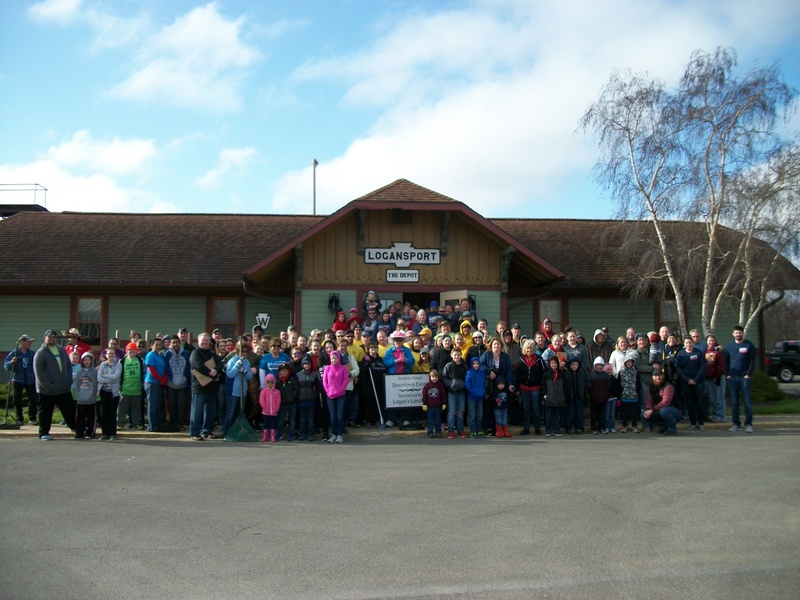 Logan’s Landing is recruiting volunteers to help pick up litter, sweep, weed and trim, and generally spruce up Logansport’s downtown district on Saturday April 20 from nine to noon. Volunteers may be individuals, families, or teams from businesses, churches, clubs or other organizations. Volunteers are asked to bring their own yard work tools and gardening gloves with them. Register today by e-mail (lldirector@loganslanding.com) or phone (574-722-9345) and give an hour or two of your time to make our downtown district an area we can all be proud of. Let’s all help make downtown Logansport Green and Clean! Here’s a photo of last year’s volunteer crew. Logansport has been nominated for the America’s Main Street contest, for a chance to win $25,000 and related prizes for downtown revitalization. Please use the link below to vote for Logansport; you can vote once a day through April 21st to help us advance to the quarter-finalist round. We need community support to win! You can vote once every 24 hours, per IP address. For more details, to read Logansport’s nomination, and most importantly, to vote, visit mainstreetcontest.com. 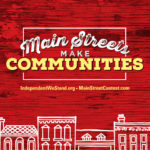 The direct link to vote for Logansport is https://www.mainstreetcontest.com/profile/56. 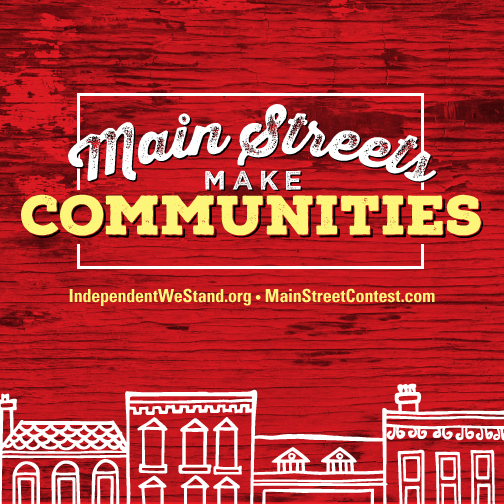 America’s Main Street contest is sponsored by Independent We Stand, STIHL Inc, Do it Best Corp, Flip This Town, Nationwide Marketing Group, North American Retail Hardware Association, and PPG Paints. Logansport Re-Imagined announces the return of the LRI Speaker Series! The first session of 2019 is a collaborative effort between Logan’s Landing and the Logansport Planning Department, and is scheduled from 5:30-7 p.m. Wednesday, February 13 at the State Theatre in downtown Logansport. More than 100 Logansport residents participated in Logansport’s HCI Community Forum and identified downtown development as one of the top three Quality of Life items critical to making Logansport an attractive place to live in the future. Participants also identified a thriving downtown as part of their vision for a thriving economy. Additionally, they asked for more communication with the public regarding opportunities. During the first session of the Logansport Re-Imagined Speaker Series on February 13, attendees will be able to learn about a variety of different programs currently available in Logansport, including the Logan’s Landing Facade Program, the new Commercial Exterior Improvement program offered by the Logansport Redevelopment Commission, the sidewalk 50/50 program for businesses and the Historic Renovation Grant Program through the Office of Community and Rural Affairs. The City of Logansport is also in the early stages of determining the community’s interest in applying for the Main Street Revitalization Program (or MSRP) grant offered by the Office of Community and Rural Affairs. Eligible projects through this program typically include downtown infrastructure rehabilitation, streetscape activities, and façade renovations. In addition, Logan’s Landing will provide information about opportunities for volunteers to serve on downtown revitalization committees or get involved in events like the Taste of Cass County. Representatives from these organizations, along with members of the Historic Preservation Commission, will be available to answer questions. Those who own property in downtown Logansport or in one of the city’s TIF districts are encouraged to attend, along with anyone who would like to learn more about ways to get involved in efforts to work together to make Logansport a place where we are all proud to live, work and play. Future events in the Logansport Re-Imagined Speaker Series will focus on other topics of interest identified through the Logansport Re-Imagined process. For more information about this specific event, contact Logan’s Landing at 574-722-9345. Logan’s Landing’s thanks everyone who helped make our 19th annual Downtown Christmas Open House a success! 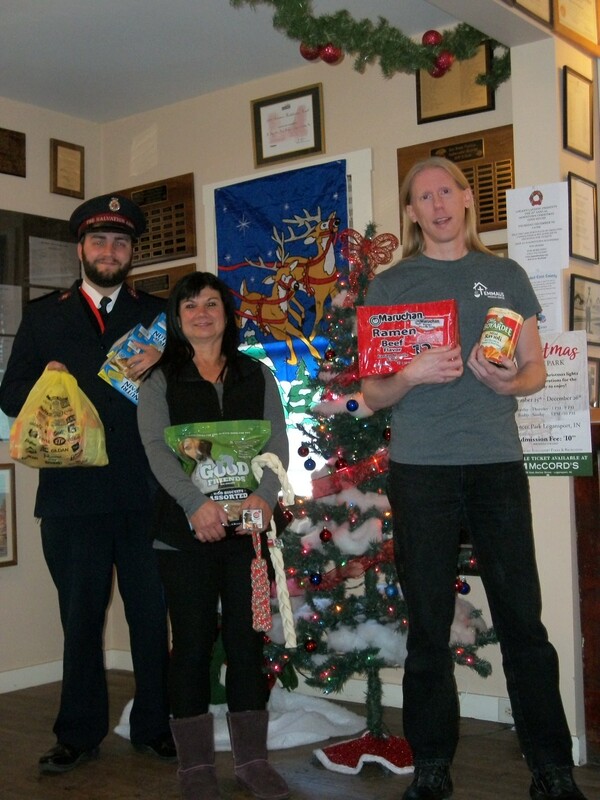 By exchanging donations of food and pet items, paper goods and cleaning supplies for tickets and depositing those tickets at participating merchants, many lucky shoppers won great prizes, while helping our community’s less fortunate and supporting local businesses. Additionally, there were 13 Prize Passport winners, who visited all 16 merchants and won a combined total of $850 in Logan’s Landing Bucks! Thanks to the generosity of the community, we again collected more than half a ton of donated items! These items have been distributed to the Emmaus Mission Center, Salvation Army, and the Cass County Humane Society. Special thanks to all of our volunteers, and especially to Michelle Dials for once again chairing the event. Thanks again to our participating merchants: Bodyworks, Carly’s Creations, Cass County Entrepreneurs Member Vendor Market, Drive Now Auto Credit (Mike Anderson), 50 Shades of Beauty, Garnet’s Bakery & Boutique, Judy’s GoodLife Emporium, Legacy Outfitters, Minglin Jewelers, The Nest, Pear Tree Gallery, The People’s Winery, the Record Farm & State Theatre, Senior Helpers, Yankee Julep Boutique, and Yelle’s Boutique. Special recognition goes to Carly’s Creations, the winner of this year’s Spirit of Christmas Award for the fun and festive atmosphere they provided to event attendees! Congratulations once again to all the prize winners: Teresa Almon, Christy Bean, Rita Birnell, Andrea Bridge, Sheryl Buzbee, Dorine Deason, Marla Evanich, Jan Fawley, Jackie Hamilton, Trevor Herman, Beth Johnson, Angela Lange, Tim Lange, Heather Nacke, Kiley Nason, Susie Oliver, Angie Reynoso, Robin Rozzi, Alicia Shackelford, Amber Shackelford, Joyce Shaffer, Mary Ann Shuck, Bev Tabler, and Victoria Winegardner. FALL EVENTS ENJOYED BY ALL! Logan’s Landing thanks everyone who helped make this year’s Downtown Spooktacular a great success! 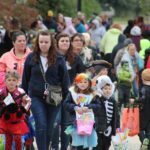 We estimate over a thousand trick-or-treaters converged on downtown Logansport on October 25th for this long-time annual tradition. Thank you to the volunteers who helped make this event happen, and thank you to the 28 participating merchants! Most of the trick-or-treaters stayed for the Elks Halloween Parade immediately after the Downtown Spooktacular – congratulations to Elks Lodge #66 for continuing this tradition year after year and generation after generation. 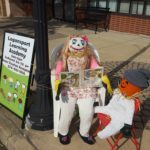 Adding to the Halloween atmosphere downtown were 39 scarecrows created by local businesses and organizations. Again this year, we were amazed at the creativity and imagination displayed! Congratulations once again to the Judge’s Choice Award winner: Mom’s Taxi, and to the People’s Choice Award winner: Logansport Fire Department. Happy Halloween from Logan’s Landing! Logan’s Landing announces the return of your favorite downtown Halloween traditions. 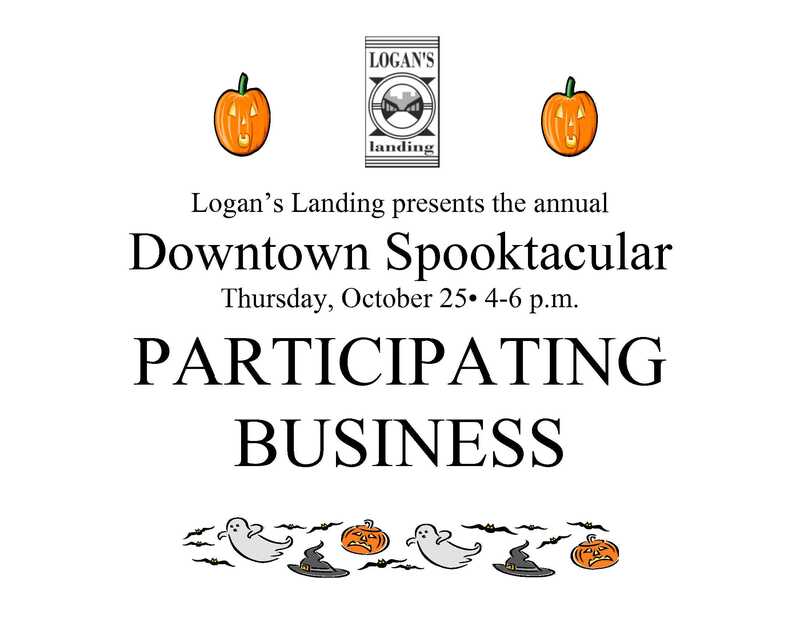 On Thursday October 25th from 4-6, participating merchants in downtown Logansport will hand out treats to costumed trick-or-treaters during the Downtown Spooktacular, so bring the kids on down! Afterwards, kids can participate in the annual Elks Halloween Parade immediately following the trick-or-treating. And be sure to check out the entries in this year’s Scarecrow Row competition, located along Market Street and Broadway. Downtown Spooktacular participating businesses will be announced by social media and local media. Look for the Spooktacular signs at participating locations. Look for the sign below at participating merchants! 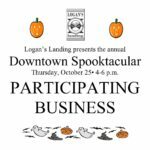 Registration is underway for Logan’s Landing’s annual Scarecrow Row Competition, Downtown Spooktacular and Downtown Christmas Open House. 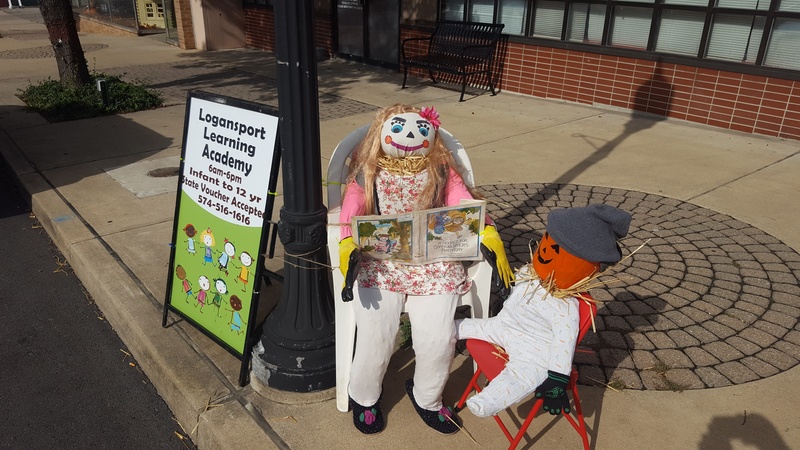 Local businesses and organizations are invited to decorate scarecrows to be displayed from October 11 through November 1 along “Scarecrow Row” on Market Street and Broadway in downtown Logansport. 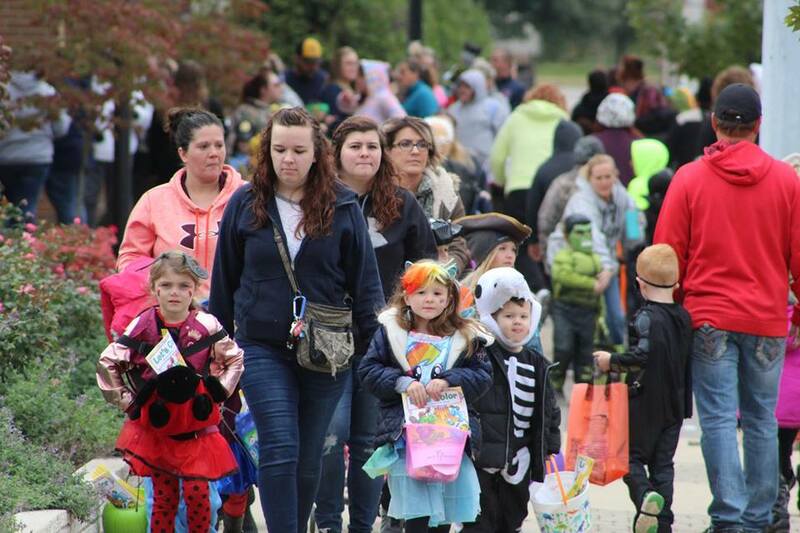 On Thursday October 25, participating downtown businesses will hand out treats to costumed trick-or-treaters during Downtown Spooktacular, immediately followed by the Elks Halloween Parade. The Downtown Christmas Open House is scheduled for Thursday, December 6. Registration packets are being distributed to past participants; if your business or organization is interested in participating in any of these events, please contact Logan’s Landing at (574) 722-9345 or lldirector@loganslanding.com. Registration deadline is October 4. You may recall that lifelong Logansport resident Aaron Anderson is bicycling 2500 miles from Logansport to Santa Barbara, California, following the legendary Route 66. 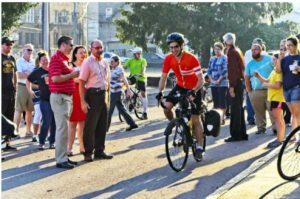 This trip is raising money for Logan’s Landing, the Main Street organization devoted to revitalizing downtown Logansport. Aaron is calling this fundraiser “Miles for Main Street” and is asking supporters to make a pledge per mile, or make a donation of a predetermined amount. Donations are tax-deductible. More than 50 people turned out on August 3rd for the send-off at the Depot – thanks! Aaron is now approximately halfway through his journey, and is checking in every night via the Miles for Main Street facebook page. 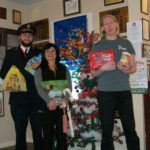 He is still soliciting donations; credit card donations can be made at the Miles for Main Street facebook page, or at www.loganslanding.com. Checks can be mailed to Logan’s Landing at PO Box 473, Logansport. Please continue to keep Aaron in your thoughts and prayers as he continues this adventure! For more information, contact Logan’s Landing at 574-722-9345 or lldirector@loganslanding.com.